I imagine many a crafter (myself included) hoards Washi Tape like it’s going out of fashion. I often get asked, while purchasing the odd tape, what project I have in mind for it. Embarrassed, I usually admit that I have no such project in mind and that I merely collect and collect in the hopes that one day, a purpose will rear its head and then, lo and behold, I will have the exact right tape for it. I just love having many options to play with when I’m in the middle of a project! 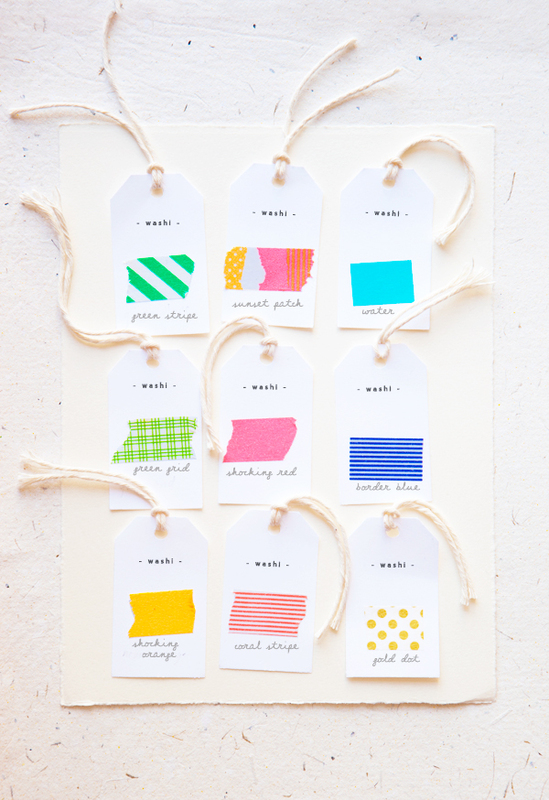 While browsing Pinterest recently, I stumbled upon this gorgeous idea for fabric swatches. Inspired, I created a similar one out of some samples of tape from the shop. Although I am partial to the neon ones and the ever popular Sunset Patch, my personal favorite is actually the Green Stripe! What are your favorites? These are merely a few of the options available- see the whole collection. I really like Sunset Patch and Water. This makes me want to up my washi tape game! Cute. Water and Gold Dots are my favs! I love the Sunset Patch and Gold Dot! Don’t worry Amy. I do that too. In fact, I not only hoard washi tapes but craft materials in general. Haha! I love the blue and white stripes! This is a beautiful way to dispay your tapes. I also buy washi tape all willy nilly to have the perfect tape for every project! Hi, this is a so beautiful and easy way to present your favourite washis! I hate Tesa I always use Washi Tapes because they are so much cuter. For partys I like them who glows at night. My favourite here is “water”! This colour remembers me to sea! But in one week I’m going to Harlem by car so we have time for going to the sea, ans we can trink a coffee at Amsterdam! My favs are the sunset patch and the gold dots! very cute collection!